First of all, let me start off by saying that this was the first anime that I have ever watched. Though at the time, I didn't know it was an anime. I think I was 5 years old when this movie came on T.V. but I wasn't home to watch it and my mom seeing a commercial earlier for an Aladdin movie on T.V., she decided to record it. Unfortunately, the VHS that she had, only had room for about 30 minutes of taping. Even though I had only watched 30 minutes of this movie, the images would always stay in my mind. The movie was made in 1982 so keep in my mind the technology they had for graphics and sound. The movie stayed very true to the original Aladdin story in my opinion (much more so than the Disney version). Even the Japanese opening song was in an Arabic tune to make things seem more authentic. The Scenery and drawings in the movie were very well done for its time. The details in everything from the shining fruit in the underground gave to the Arabic city streets lined with pots and clothes and food stalls...everything was very well drawn. The effect the animation style had on me even as a child was something amazing because I remember being scared for Aladdin when the sorcerer trapped him in the cave. Overall, for its time, the animation was amazing. Now for the sound, I only watched the dub, however even with the dub, I felt like the characters were well portrayed and that their voices did not deter from enjoying the stories. The music was nothing special but it stayed true to the Arabic theme. The only thing I found annoying was maybe Princess Badral's voice and the fact that they recycled the "busy street people" sounds in the background, but again, this doesn't deter from enjoying the story. For those that have only watched the Disney version, be prepared...because this version seems more authentic (less modernized). This is not a bad thing though because the story is different and interesting and I felt like I was watching something new even though I knew the story of Aladdin. For example, Aladdin gets married to Badral even though he's only a kid. If you can keep an open mind, these concepts will intrigue you more than turn you away from the movie. The pacing of the story changes half way through the film, I don't know if it's because I'm biased because I only watched the second half recently, but I felt as though the first half took its time to let the watchers to introduce Aladdin and his life. 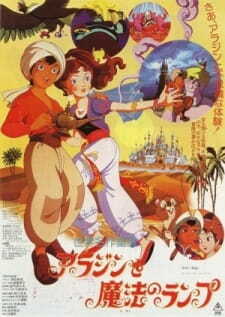 The second half where he meets Badral, everything seems to go faster...even how fast him and Badral fall in love and get married and how soon the Sorcerer manages to steal Aladdin's lamp. The fast pacing near the end kind of threw me off but I still enjoyed the story none the less. This movie really was the epitome of my childhood and for those that don't mind a little outdated animation, I think it's definitely a good watch.